I adore the outstanding variety of mature Sonoran desert landscapes, particularly with the magnificent mountain and city views as the backdrop. 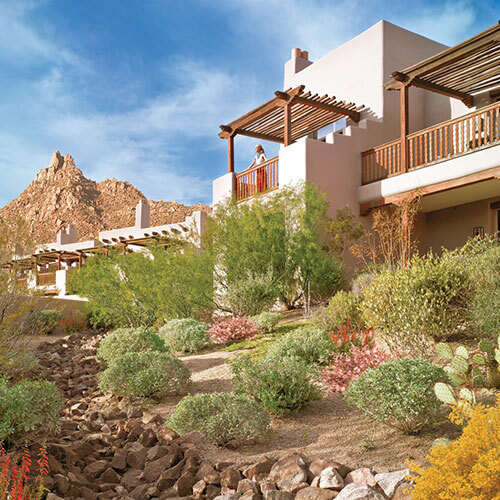 Well-designed landscaping seamlessly blends with the desert surroundings, allowing for striking views from the territorial-style casitas, each with a fireplace and terrace. Architect Hill Glaser took into consideration guests’ comfort when designing the resort’s accommodations, public areas and magnificent views. As you approach the property, you'll know you’re in for a special treat as you cast a gaze over Pinnacle Peak and Crescent Butte mountains. Draw your sight back toward the property to enjoy the landscaping. Entering the lobby, you’ll be presented with a breathtaking view of the valley. Just off the lobby is an elegant lounge that beckons you to grab a seat at the back-lit onyx bar or to meander outside to the balcony. Shopaholics will quickly detect the upscale shops situated in a small courtyard adjacent to the lobby. Golf fanatics shouldn't forget to pack the clubs as you’ll want to take advantage of the on-site course, which was designed by Tom Weiskopf and Jay Moorish. In your territorial-style casita you’ll find elegant wood furnishings, overstuffed chairs that flank a gas-burning fireplace and a private terrace or balcony with comfortable seating. Wood shutters shield the room from the afternoon sun, creating a cozy ambience. Smoke free premises. 210 units, some two bedrooms. 1-3 stories, exterior corridors. Accessibility (Call). SR 101 exit 36 (Pima Rd), 4.7 mi n, 2 mi e on Happy Valley Rd, then 1.5 mi n on Alma School Rd. 10600 E Crescent Moon Dr 85262. 3 restaurants, also, Talavera, see separate listing, full bar. sauna, hot tub, steamroom, regulation golf, tennis, recreation programs, kids club, lawn sports, trails, health club, spa. valet laundry, boarding pass kiosk, airport transportation, room service, child care, area transportation-golf course and trail head.